The cave data available here is in the form of files and directories that can be easily downloaded and used on a your home computer. The purpose of the Cave Registry is to back-up and share these files among anyone who is interested so that the data can be improved and updated more efficiently than is currently the case. The tool we use to back-up, update and share files efficiently is called a Version Control System (VCS). It is how almost all programming teams share and develop their source code. For this data we are using the Subversion version control system. 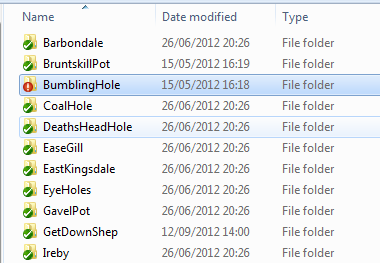 A single set of files and directories comprising one survey data set. 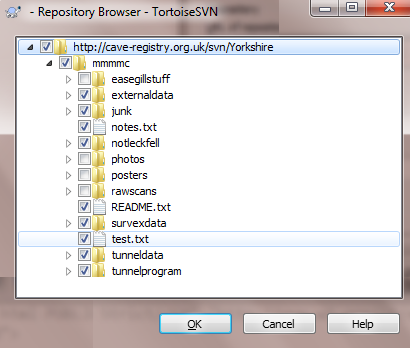 For example, cave-registry.org.uk/svn/Yorkshire is the repository of cave survey data from Leck Fell. The first time you copy the contents of a repository from the Cave Registry to your home computer. Each subsequent time you copy recent changes to the repository from the Cave Registry onto your home computer. The act of uploading the changes and additions to the cave data files you have made on your home computer back to the Cave Registry. The note you write each time you commit a batch of files to the repository which describes the changes made. The state of the repository (the set of files and directories) at some point in the past between two consecutive commits. The act of undoing a recent series of commits to the repository, usually after a mistake. The act of discarding the changes you have made to your files without committing them. Download and install TortoiseSVN. This will add some extra functions into the File Explorer for handing Subversion repositories. Click the link on the Cave Registry corresponding to the repository you want to checkout, and copy the URL from the browser. Create a new empty directory on your own computer, right click on it with your mouse, and select the SVN Checkout option. Optional: You can avoid downloading everying (scans, photos, posters adding up to over a Gigabyte) by clicking on the [Choose items...] button and unticking those directories that you know are huge. Click [Okay] and watch all that lovely cave data being checked out onto your hard disk. 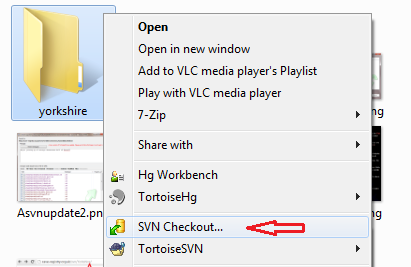 At any later time you can right-click on the same directory and select SVN update (even if you have interrupted the check out) to receive the most recent changes. If you make any changes to these files on your home computer, TortoiseSVN will draw a red icon on the files and directories containing them so you can see what needs to be committed. Always update from the repository just before you commit to avoid creating a clash, which is when someone else has edited and committed the same files as you have before you. This service follows the proposal outlined in Compass Points 25. A previous set of instructions in PDF form can be downloaded from here.